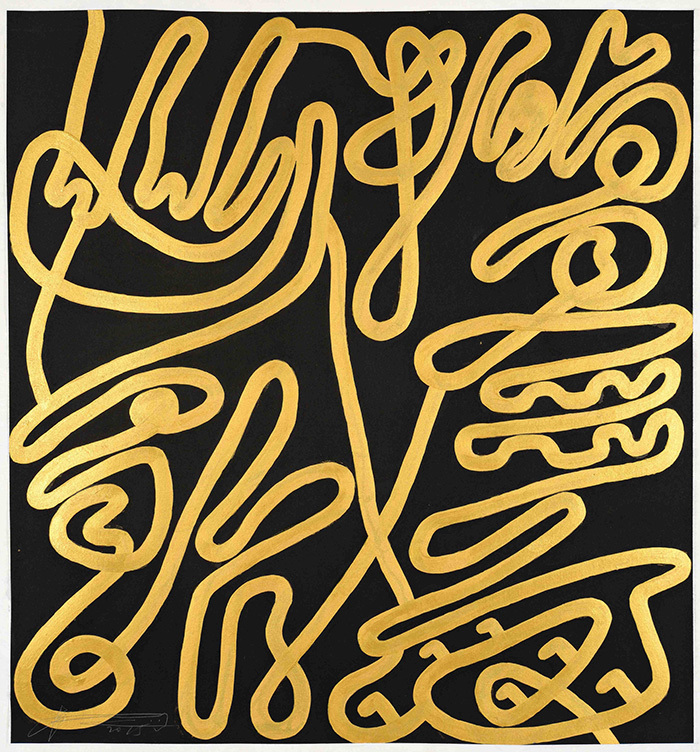 This abstract calligraphic painting, with gold acrylic and ink on a black background, recreates, in a modern idiom, the characters for 'mountain' and 'river'. Born in Datong, Shanxi, in 1964, Wei Ligang has been at the forefront of contemporary ink painting’s development from its beginning, and he was one of the organizers of the June 1999 “Bashu Parade” exhibition. Wei studied mathematics at the Nankai University in Tianjin and he became the president of the calligraphy society at the university. His training in mathematics has contributed to his abstract form of calligraphy. He constantly deconstructs and re-forms the characters in his paintings while hinting at traditional script-forms (such as formal, running, or “grass” script), thus declaring his deep roots in Chinese culture. Below are more selections from Michael Goedhuis' Asia Week New York Contemporary exhibition Changing China: Contemporary Ink Painting, on view at Traum Safe, 1078 Madison Avenue, from May 4 to 10. An opening will be held on the evening of May 4 from 6–9pm.